So, what are the top surface technologies than can help you prevent these injuries in care environments? By better controlling excess moisture and temperature at the patient skin and surface interface, Skin IQ can optimize pressure injury management. The heel is particularly susceptible to pressure injury and often in need of specialised protection, and it may be recommended to offer complete and permanent off-loading.1 This can be made possible through Wound Valve™ Technology found in Arjo’s Nimbus range that isolates and permanently deflates air cells in the foot section of the mattress. 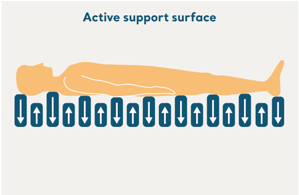 Regular repositioning, the cornerstone of prevention, is most likely to occur when clinicians have immediate access to lifting equipment.18 Besides supplementary repositioning aids, beds such as the Citadel C200 have integrated ‘patient turn’ features to complement the manual repositioning of patients for periodic care procedures, while reducing the physical burden for the caregiver. The Citadel Patient care system also provides a continuous patient turn function which can complement or supplement routine repositioning while allowing the patient to rest. Active and Reactive Pressure Redistribution, Microclimate Management, Heel Flotation, together with Posture and Repositioning, are all effective methodologies to help prevent pressure injuries. It is important, however, to match product functionality with individual therapy goals, as well as the care environment, to ensure the right surface for the right patient at the right time. To learn more about Arjo’s range of pressure injury products, please download the document below. Choosing the most effective pressure redistribution and Microclimate management solution should be based on a holistic assessment of your patient or resident. Please contact your local Arjo representative to find out which solution can be best tailored to your needs. Arjo Clinical Evidence Summary – Pressure Injury Prevention Solutions. Dealey C, Posnett J, Walker A (2012). The cost of pressure ulcers in the United Kingdom. Journal of Wound Care; 21(6):261-266. Brem H, Maggi J, Nierman D et al. High cost of stage IV pressure ulcers. Am. J. surg. 2010; 200:473-477. Iglesias C, Nixon J, Cranny G et al. (2006) Pressure relieving support surfaces (PRESSURE) trial: cost effectiveness analysis. BMJ 2006;332(7555):1413-1415. Clark M. (2000). Models of pressure ulcer care: costs and outcomes. British Journal of Healthcare Management. 2000; 7(10):412-416. Trueman P, Whitehead SJ (2010). The economics of pressure relieving surfaces: an illustrative case study of the impact of high specification surfaces on hospital finances. International Wound Journal. 2010;7:4-54. Newton H (2014). 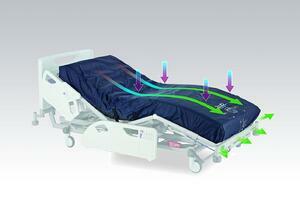 Evaluating a pressure redistribution mattress replacement system. British Journal of Nursing, Suppl 20:s30-35. Newton H (2015). A 6-month evaluation of a non-powered hybrid mattress replacement system. Br.J Nursing, 11:24(suppl):S32-36. Bedo J (2013). Reducing hospital acquired pressure damage: An NHS acute trust initiative. British Journal of Nursing, 22(20):S24-S28. Bed TiME: Non powered hybrid therapy (AtmosAir 4000™) and the impact on patient care, staff, and powered dynamic mattress usage. Poster Presentation: 19th EPUAP Annual Conference, Belfast, Sept 2017. Beth Israel Medical Centre, NY. Use of self-adjusting technology (SAT) mattress to help reduce a facility’s use of therapeutic overlays. ArjoHuntleigh Case Study on file. Reger S, ranganathan V, McNulty A (2014). Use of a powered coverlet for moisture removal, skin temperature reduction, odour and bacteria control. J Wound Ostomy Continence Nursing, 41(1)35-39. Clark M, Lahmann N (2017). Clinical evaluation of the Skin IQ Microclimate Manager and case reports. Wounds International. 2011 (suppl.):1-4. At: http://www.woundsinternational.com/media/issues/533/files/content 10235.pdf accessed August 2017. Kohr R (2011). Simple solutions for low air loss needs: evaluating a new surface. Poster presentation, 30th CAET National Conference, Montreal, Quebec, May 26th-29th. Collier M, Potts C, Shaw E (2014). Use of a coverlet system for the management of skin microclimate. British Journal of Nursing (Tissue Viability Supplement 23(15):S28-35. Phillips L. Pressure ulcer prevention: keep it safe, keep it simple. In: Duffy V, Lightner N (eds). Advances in Human Aspects of Healthcare. Proceedings Applied Human Factors and Ergonomics: USA. 2014; 3: 19-24.